(DrEddyClinic News) Bowel diseases are numerous and unpleasant. 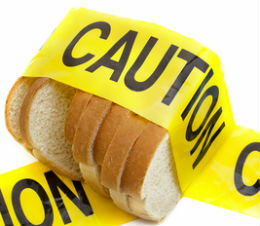 Among them, celiac disease http://bit.ly/what-is-celiac-disease is perhaps one of the strangest and least understood. The condition is believed to stem from an abnormal reaction of the small intestines to gluten proteins, which triggers a sort of self-destructive immune response within the upper bowels. Fortunately, there is a growing body of scientific research which supports the use of beneficial probiotics http://bit.ly/health-benefits-of-probiotics and eating gluten-free foods, as part of your Celiac Disease diet, can help alleviate those uncomfortable symptoms. Gluten is commonly found in a variety of foods and provides shape and texture. Healthy bodies are able to digest gluten like any other food. In patients who suffer from celiac disease however, gluten is treated very much like a severe allergen, and the presence of even small amounts can trigger intense flare-ups. How Does Gluten Aggravate Celiac Disease? The lining of the small intestines are covered with delicate, specialized tissue called villi. The name, which means “shaggy hairs” in Latin, accurately describes their appearance. Villi are responsible for the uptake of vital nutrients from food, and for patients with celiac disease, they can also become a source of agonizing pain. When gluten proteins become entangled in the intestinal villi of a person with celiac disease, their body’s defense mechanism mistakenly attacks the gluten AND the villi. This interrupts the absorption of vitamins and minerals and can ignite a range of painful side effects. Typical symptoms of celiac disease include abdominal pain due to gas http://bit.ly/6-causes-of-flatulence and bloating http://bit.ly/what-is-bloating, constipation and diarrhea http://bit.ly/effects-of-diarrhea, nausea, and vomiting. These can be periodic or constant depending on the individual. Over time, the diminished ability to process nutrients can also lead to more serious issues such as anemia, depression, fatigue and body aches, even hair loss and stunted growth in children. How Can Probiotics Possibly Alleviate Celiac Disease? Researchers have had a great deal of success reducing the symptoms of a number of different digestive conditions using readily available strains of beneficial probiotic bacteria. During a recent study, scientists at the National Spanish Research Council in Valencia, Spain, created an artificial small intestine and synthesized the internal effects of the disease . According to the Spanish researchers, experimentation with a variety of probiotic strains showed great potential in improving the resilience of intestinal tissue, as well as reducing the immune system’s overall hostility towards it. And although real world human medical trials are still needed, the use of probiotic bifidobacteria, specifically, appears especially promising as a long term option for patients with celiac disease. Are you sensitive to gluten or do you have celiac disease? Have you had success with probiotics or other Celiac Disease diet? Leave a comment and we’ll discuss! Federation of American Societies for Experimental Biology. Gut bacteria offer new insights and hope for people with celiac disease http://www.sciencedaily.com/releases/2010/04/100429102818.htm. ScienceDaily. 2010 May 1.